Updated 12/23/2011: Corrected thermal pad info. Added V1 2 stream retest charts. Summary Marvell-based dual-band, dual-radio N router with Gigabit ports, USB drive sharing/media serving and three-stream N (450 Mbps) support on both bands. 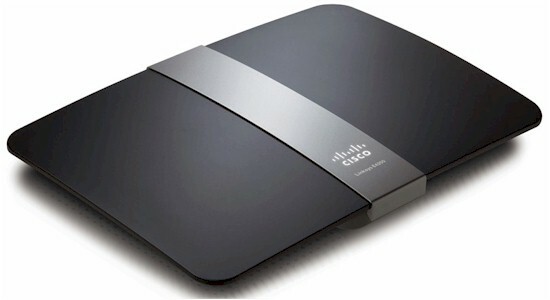 Same router as Linksys EA4500. When I started getting requests to review the V2 version of Cisco's top-of-line Linksys E4200 router [reviewed], I didn't give them much thought. Unless manufacturers really mess things up, most product revisions are more focused on cost reduction than new features or improved performance. So re-reviews aren't really worth the effort. So I was surprised when I checked with Cisco and found that the E4200V2 is actually a new product, with a complete redesign. I'll leave why Cisco chose to not give the V2 its own E-series number up to their marketing wizards, but it's bound to cause some consumer confusion. Or wait, maybe that's the goal? From the outside, the V1 and V2 are identical, even down to the same Linksys E4200 (without "V2") on the front nameplate. The back panel (shown below) is the same too, with all the same ports and switches. I'm surprised that Cisco didn't upgrade the USB port to 3.0. From the drive-sharing performance I saw, the V2 might be able to use USB 3.0's extra bandwidth (more later). Forum posts had already given me the heads-up that the V2 is based on Marvell silicon. And that's what I found when I opened up my review sample after testing was done. Without further ado, here's a comparison of the key components in the V2 and the original. The V2 is definitely a beefier design than the V1 since it has a separate 1.2 GHz CPU vs. the V1's shared (with the 2.4 GHz radio) CPU and much more RAM and flash. I'm not sure exactly what the V2's processor is, other than it is made by Marvell. So I've provided the numbers I found etched on the CPU and perhaps one of our helpful readers will enlighten us. The same two-device radio (88W8063 Dual-band 3x3 MAC/BB and 88W8366 Dual-band 3x3 MIMO transceiver) is used for both radios, with the difference being the SiGe power amplifiers, which are different for each band. Note that SiGe power amplifiers (P.A.) and RF front-ends were also used in the V1. The Marvell 88W8063 / 88W8366 aren't new devices. They first appeared in the Apple Airport Extreme back in 2009 and more recently in D-Link's DIR-665. Apple switched to Broadcom's BCM4331 for the Gen 5 Extreme and it's also the 5 GHz radio in the E4200V1. The photo below shows a very clean and largely symmetrical design. The 5 GHz radio is on the left and the 2.4 on the right. Antenna placement is not symmetrical, with the 2.4 GHz radio's antennas more tightly clustered than the 5's. Popping off the RF can tops revealed the mostly-Marvell innards seen in the photo below. The CPU, RAM and switch were thermally coupled to the top of the RF enclosure via thermal pads that were removed for the photo. The switch chip (right side) was not thermally coupled. The thermal pads don't seem to have much work to do; the router didn't generate much heat at all, especially when idle. A closeup of the V1's board is shown below for your reference. Refer to the original review for more commentary.